My Place Realty is happy to support and donate to such a worthy cause. First and foremost, I just want to say how proud I am to be part of a company that takes the time and makes a huge effort to fundraise for organizations such as the Lighthouse Mission and Main Street Project to name a few. I am honored to be working with such a great group of people and to be part of a team that is so caring and makes it their mission to help these organizations and our communities. This morning I was fortunate enough to meet the people at the Main Street Project with Tom, our Vice-President, and get a tour of their facilities. 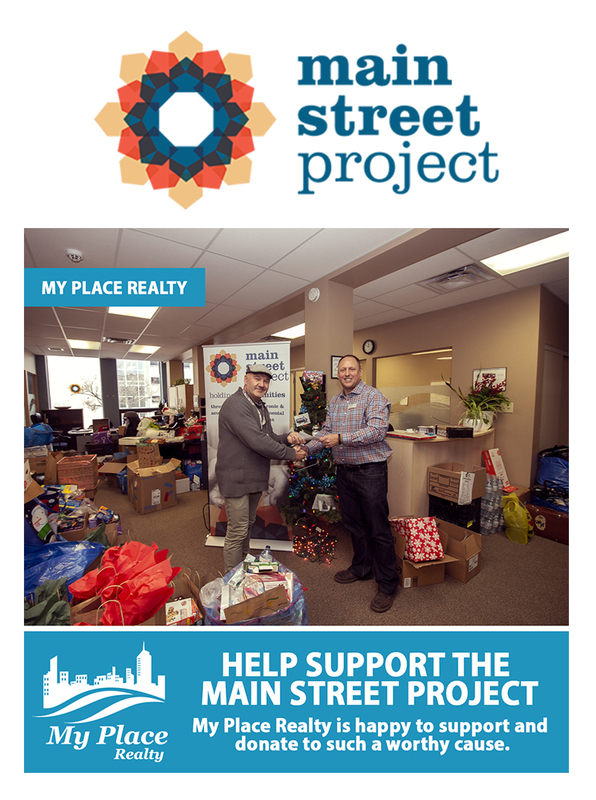 The people at the Main Street Project truly love what they do and it isn’t an easy job. For those who have never been to this area, it can be a rough neighborhood but is patrolled by the Winnipeg Police Department and Winnipeg Biz Patrol. It was very difficult and overwhelming to walk through this facility as you can see how many people need help with their addictions and homelessness. I was overcome by emotions to see a great number of people lying next to each other in a room the size of our boardroom. Main Street Project is doing great things to help rehabilitate people who are wanting to make that change in their life by placing them through their programs and company initiatives. Recently, the Main Street Project acquired the iconic Mitchell Fabrics building located at 637 Main Street and is planning to renovate it to expand their services in the community. It was one of the reasons why the family who originally owned the Mitchell Fabrics company sold it to the Main Street Project as they envisioned a better community and had faith that the Main Street Project would make that positive impact in the neighborhood. I left that day feeling truly melancholy and humbled, yet glad and appreciative that there are organizations like the Main Street Project. It really was an eye opener and makes you feel grateful for the people in your life and something so simple as having food on the table and a warm place to sleep. I remembered a quote that I wanted to share with you from Ronald Reagan, “We can’t help everyone, but everyone can help someone.” Just remember that every bit of help counts, and you can make a difference. I look forward to the New Year and other company fundraising initiatives. I would also like to extend a warm thank you to Tom for letting me be part of this meeting with the Main Street Project.